EVGA X58 SLI - Intel X58 Motherboard Roundup - What does $300 Get You? There aren't too many bells and whistles on the EVGA X58 SLI from a hardware feature viewpoint, and considering the market for this board we think that's a good design choice. The almost universal Realtek RTL-8111C PCIe Gigabit Ethernet controllers are utilized in tandem; the Realtek ALC-889 is on board for HD audio; and JMicron’s JMB362/363 chipsets get the nod for eSATA, IDE, and additional SATA port duties. TI is selected for IEEE 1394a support and the Intel ICH10R is utilized for primary storage purposes. We have never been real big fans of either Realtek audio or JMicron IDE, but considering the dearth of competition in the onboard peripheral market, you make do with the provided choices. 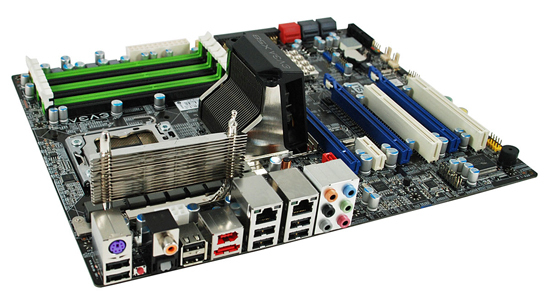 The BIOS is designed to get the most out of the board when overclocking. At first glance, some of the available options like the number of memory timings seem sparse compared to the ASUS and Gigabyte offerings. However, EVGA does a very good job of setting sub-timings to optimal points so far in our testing. We still prefer the ability to set additional memory timings and skew levels ourselves, but we can certainly live with the decisions made by the BIOS, although those at the bleeding edge of benchmarking would probably prefer the additional control level in either the ASUS or Gigabyte products. We just received BIOS IX58SZ17 that features additional memory settings and fine tuning options. We will update our comments and results once we have finished testing. In a nod to the users who like to cool their systems via cascade or LN2, EVGA provides two different modes to properly set the board at POST for sub-zero temperatures. Those who love or need voltages to improve clock speeds will not have any problems with the choices provided by EVGA. DRAM voltages sky rocket up to 3.075V and VCore goes to a nice silicon melting 2.3000V. VDroop control can be enabled or disabled. In fact, the board has a tendency to slightly overvolt with VDroop control disabled. Also, you can fine tune the frequency level on the digital PWMs. We normally left it at 800KHz to help reduce temperatures in the CPU area but switched to 1067KHz when overclocking our i920 past 4GHz. We were able to get an additional 80MHz out of our CPU on air by switching from 800 to 1067 once we passed 4GHz. EVGA also provides a setting called a dummy overclock; quite simply, enable this setting and the board will set itself to run a 20x160 overclock on the i920. We found the settings to be perfectly stable during benchmark testing, though obviously that's a far cry from what manual overclockering can achieve. EVGA also supports a stock 1333MHz memory speed on the i920/i940 processors along with opening up QPI link speeds from a standard 4.800 GT/s up to 6.400 GT/s, which is standard on the i965 Extreme processor. We were disappointed with the lack of OC profiles in the initial BIOS, but the latest BIOS allows a total of eight profiles to be saved. Finally, the board fully supports 12GB of DDR3 memory. We have not had any real problems running 12GB of our Patriot or G.Skill DDR3-1600 kits at 1600 with 8-8-8-24 1T timings, although we needed about 1.70V for absolute stability. 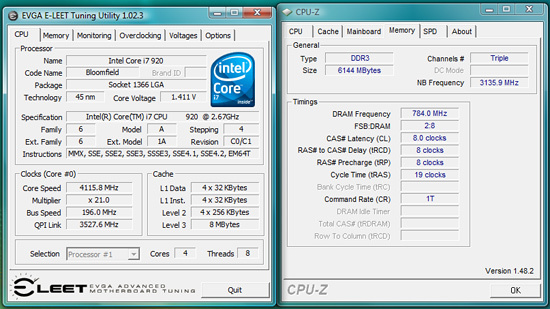 Dropping the command rate to 2T allows 1.65V operation with the current BIOS. One last item of note is that the three PCI Express 2.0 x16 slots will operate in x16/x16 mode for 2x SLI/CF if the third x16 slot is empty. If you decide to place a PCIe RAID, network, audio, or TV tuner card in the third x16 slot, then a 2x SLI/CF configuration will operate in x16/x8 mode. We did not notice any performance differences between the two modes with our HD 4870 or GTX 260 cards. 3x SLI/CF configurations will run in x16/x8/x8 mode. You can also use the first and third x16 slots for graphics if you need to open up a PCI slot but the board will run in x16/x8 mode. Although the owner’s manual states the three x16 slots are for graphics cards only, we had no problems running our ASUS Xonar D2X or Highpoint Rocket RAID cards in x16 slots two or three. The primary design goal from EVGA was to allow 3x SLI/CF operation without needing a special case design to make room for the bottom video card. Put simply, this board will allow tri-card installations in most ATX cases but at the expense of rendering the additional PCIe and PCI slots physically unusable. Keep that in mind when trying to figure out why EVGA located the lone x1 PCIe slot next to the first x16 slot. EVGA might as well have left it off the board (the same holds true for the other boards) and saved some money. We assume just about any owner willing to pay $299.99 for the board, at least $300 for a CPU, and $250 or so for 6GB of DDR3 will not be running a single slot GPU. In fact, unless you are going all out to set up up a folding machine or something similar, any GPU choice under an HD 4870 or GTX 260 is just a waste on this setup. Fortunately, the other PCIe x16 slots double for peripheral duty so those are available if needed. The northbridge heatsink is fairly large and actively cooled. We could not hear the fan over our HD 4870 card, so noise should not be a problem. We were able to comfortably fit our large air coolers on the board without too much trouble once the PWM heatsink was moved slightly. The PWM heatsink looks nice, has an impressive EVGA logo stamped on the top fin, and is generally a pain in the you-know-what to work with when installing the 8-pin ATX power connector, large CPU heatsinks, or during case installation. It does a nice job of keeping the digital PWMs cool, but we just think something in a low rise design would have been better suited. Some will wonder about the positioning of the 8-pin EPS12V power connector since it is a tight fit for most cables and the CPU fan header is right next to it just to make matters more interesting during installation. The position was chosen to provide the quickest and most stable power path to the CPU. We understand the reasoning and support EVGA’s decision, but a different PWM cooling solution would have made life easier. Other than the above, the layout is very good and works well for us in a variety of cases. The board does come with power, reset, and clear CMOS buttons. In fact, two clear CMOS buttons are provided, one on the bottom edge of the board and the other on the IO panel. A handy LED debug display is available and six of the nine SATA ports are provided in a right angle setup. 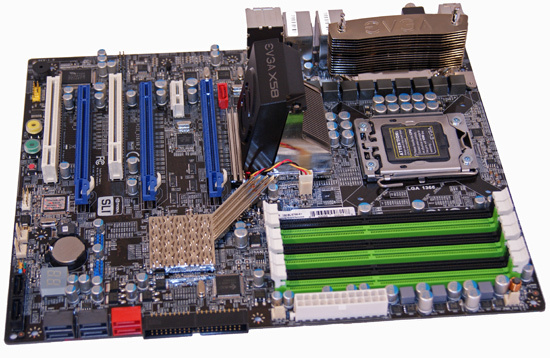 The ability of a board manufacturer to provide unique hardware or software features helps to differentiate products based on the same hardware. EVGA is hard at work in fully developing their Windows based on-the-fly overclocking utility. 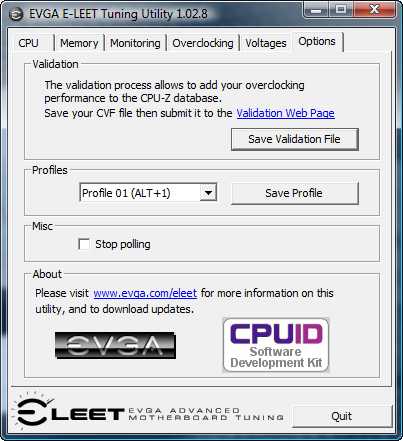 The application is known as the EVGA E-LEET Tuning Utility. We tested with version 1.02.08 that features profiles that can be saved and then applied quickly with a simple hot-key combination. The E-LEET tuning utility was created with the CPUID software development kit, so users of CPU-Z will feel right at home. In fact, the utility will create a CVF file that can be submitted for validation to the CPU-Z database. There are six tabs with CPU, Memory, Monitoring, and Option being informational in nature. The Overclocking and Voltages tabs are where the action is with this program. 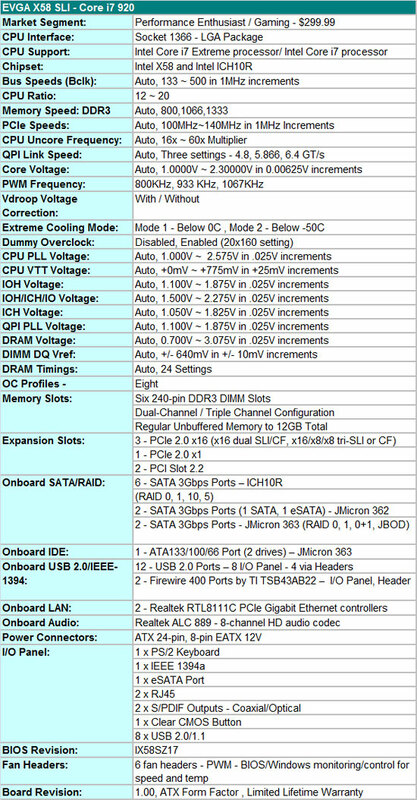 The Voltages tab allows all of the major voltages to be changed on-the-fly and the Overclocking tab lets you adjust Bclk (QPI) , PCIe bus speed, and Turbo mode. Turbo mode selections cannot go higher than what the processor allows. We found the utility to be handy in squeezing out that last Bclk step and to help ensure voltages are properly set at each overclocking step. The changes are not saved to the BIOS or a BIOS profile (hint, hint) and at this time the user will need to power down their system when exiting Windows to properly clear/reset the clock generator. We would like to see the ability to change the CPU multiplier and memory settings in future updates. Otherwise, the utility is very helpful but not a knockout, need-to-buy-the-board type of tool yet.